Tampa, Fla. – It was a battle for sixty minutes on Tuesday night as the Lightning, led by a Tyler Johnson hat trick, earned the 4-2 victory over the Carolina Hurricanes. 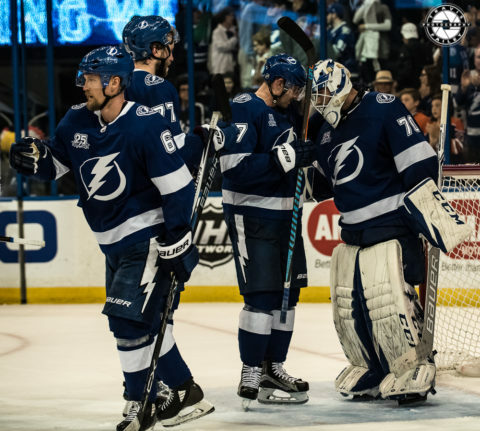 The first period was back and forth, with the Lightning attempting to capitalize on chances of their own between numerous onslaughts from the Hurricanes, directed at the Bolts backup goalie, Louis Domingue, who made his first start of the season. The Hurricanes opened the scoring when winger Micheal Ferland rifled a wide open one-timer past Domingue with 9:35 remaining in the first. Johnson responded less than three minutes later when rookie Mathieu Joseph raced past his defender and set up Johnson with a pass just outside of the crease. The goal came shorthanded, the Bolts second shorthanded goal in four games. Going into the locker room after the first period, despite the Lightning trailing 12 to eight in shots and playing four minutes down a man, the score remained tied. In the second it was a much more even affair, with the Bolts totaling 13 shots to Carolina’s 14 in the period. The Lightning did also give the Hurricanes four more minutes on the power play, but the penalty kill unit continued to play their role perfectly. In four games, the Lightning have yet to concede a goal on the penalty kill. Just over six minutes into the second Lightning winger Adam Erne took the puck across the blue line and into the Hurricanes zone on a pass from J.T. Miller. Immediately after entering the offensive zone, Erne dished a perfect pass to Johnson who split two defenders and used his speed to collapse on the crease and finish the opportunity for his second goal of the night, giving the Lightning a 2-1 lead. The Hurricanes, not to be outdone, replied with pressure. 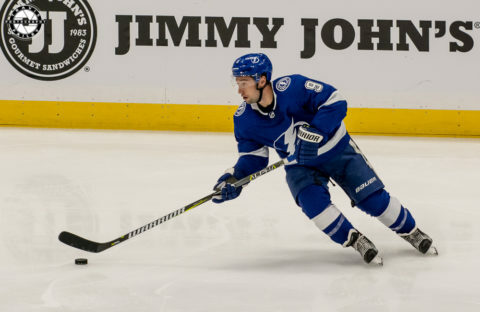 A hooking penalty to Alex Killorn ensured Carolina’s momentum swing and shortly after the Bolts returned to even strength, a turnover from Steven Stamkos allowed Hurricanes’ center Martin Necas to knot it up again, this time 2-2, with 7:12 remaining in the period. Again, the two teams entered their locker rooms tied. Six minutes into the third period the Bolts were awarded their first power play opportunity of the game on a hooking penalty to Necas and the Bolts were quick to capitalize. 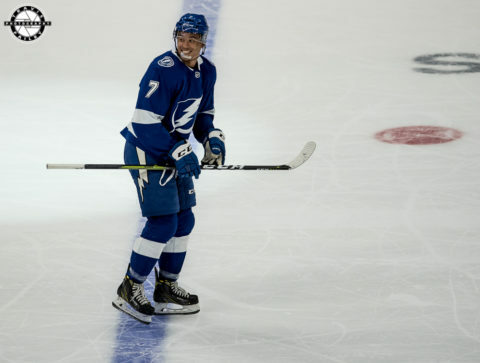 After a misplayed puck behind the Hurricanes’ net found the stick of the Bolts’ Ondrej Palat, a quick pass to the crease found the games’ hero Yanni Gourde. 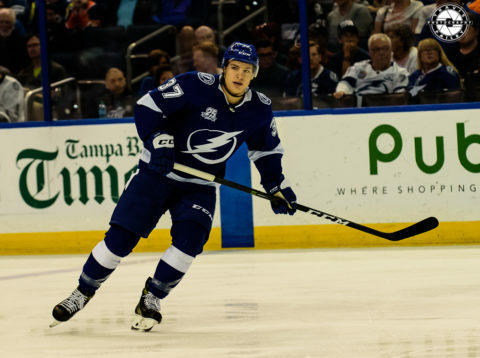 Gourde tried to put a quick shot on goal, lost control of the puck momentarily, but was able to gather and finish, allowing the Lightning to pull ahead on what would be the eventual game-winner. Tyler Johnson would add one more empty net goal with 1:56 remaining in regulation, completing the hat trick and all but closing out a spectacular performance by the Lightning, specifically Johnson and Domingue. Domingue made 38 saves on 40 shots on goal in his season debut, and rookie Mathieu Joseph notched his first NHL point on an assist to Johnson in the first period. The Lightning will play again on Thursday, October 16th at 7:30 p.m. as the Detroit Red Wings travel to Tampa for the two teams’ first matchup of the season.